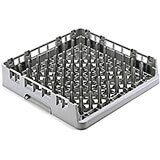 Open-ended on one side for easy placement and removal of trays of all lengths. Open End Tray Rack holds nine trays upright. Open-ended on one side for easy placement and removal of trays of all lengths. Open End Tray Rack holds Nine trays upright. Available in One size only and extenders cannot be added.